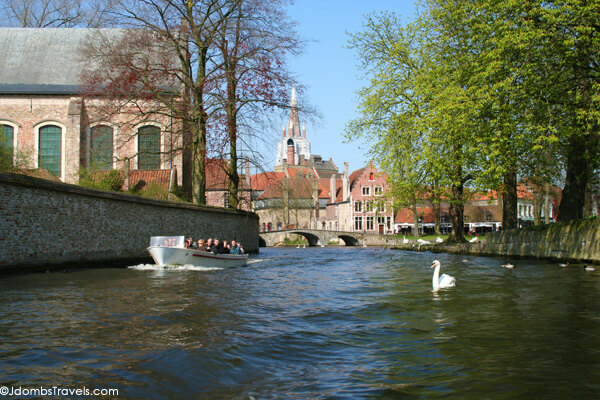 Bruges is known as the Venice of the North because of its picturesque canals. Once directly connected with the sea, gradual silting since around 1050 has caused the city to lose its direct access to the sea. The historic city center was added to UNESCO’s World Heritage List in 2000. 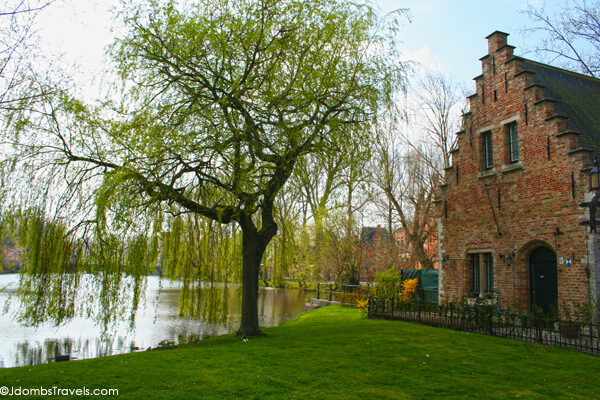 The current city boundaries still coincide exactly with those of the medieval city center, and the spaces and structures remain largely unchanged since the 16th century, making Bruges a very idyllic and picturesque place to visit. There is so much history behind the buildings, that we decided to take a guided tour of the city to learn a little more. 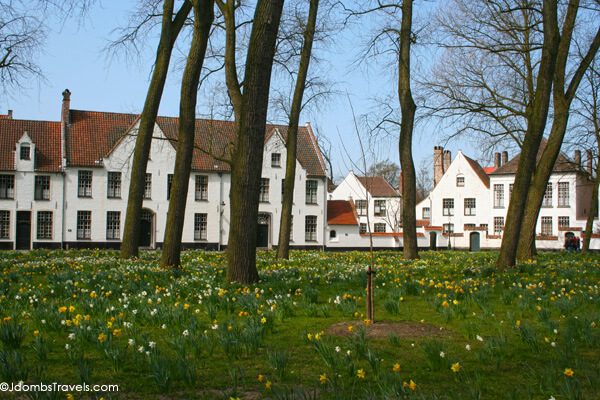 Continuing our walking tour with a knowledgeable guide, we came to the Princely Beguinage Ten Wijngaarde with its whitewashed house fronts, tranquil convent garden, and beguinage museum that was founded in 1245 by Joanna Countess of Constantinople. Today the nuns of the Order of Saint Benedict live at the site. In front of the Church of Our Lady stands the large complex of the medieval St. John’s hospital, one of the oldest still existing hospitals in Europe. It was a functioning hospital until 1978 and now serves as a museum. The Church of Our Lady, who brick spire reaches an astounding 122 meters, houses the Madonna and Child from 1504. It is one of only a few of Michelangelo’s works to ever leave Italy within his lifetime. 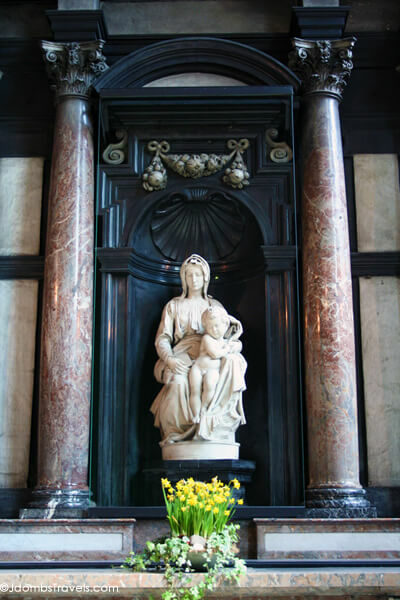 The sculpture was originally meant for the Siena Cathedral in Italy but was purchased in Italy by two Brugean merchants and brothers, Jan and Alexander Mouscron, and donated to the Church of Our Lady in 1514. 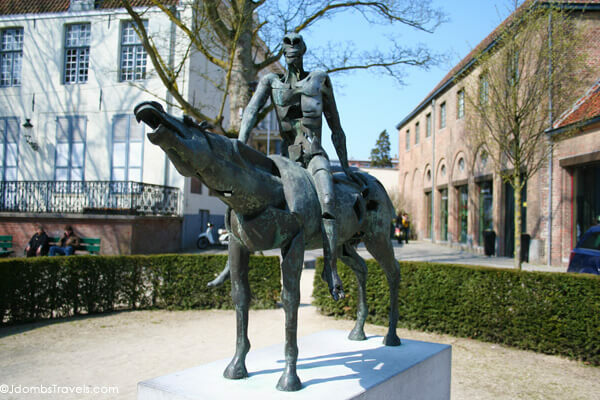 The Arendts Garden has modern sculpture representing the Four Horsemen of the Apocalypse, which are described in the Book of Revelations, the last book in the New Testament of the Bible. Though some interpretations vary, the four riders are seen as symbolizing Conquest, War, Famine, and Death. 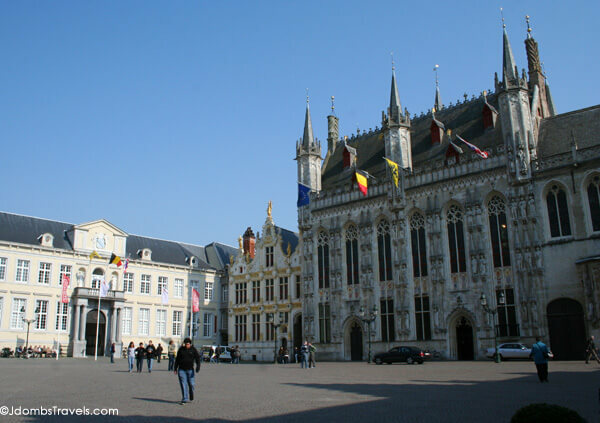 The Basilica of the Holy Blood was originally built in the 12th century as the chapel of the residence of the Count of Flanders. The basilica is comprised of an upper and lower chapel; the upper chapel houses a venerated relic of the Holy Blood allegedly collected by Joseph of Arimathea and brough from the Holy Land by Thierry of Alsace, Count of Flanders after the Second Crusade of 1147 – 1149. The lower chapel, The Chapel of St. Basil, remains virtually unchanged with a 12-century representation of the baptism of Saint Basil. 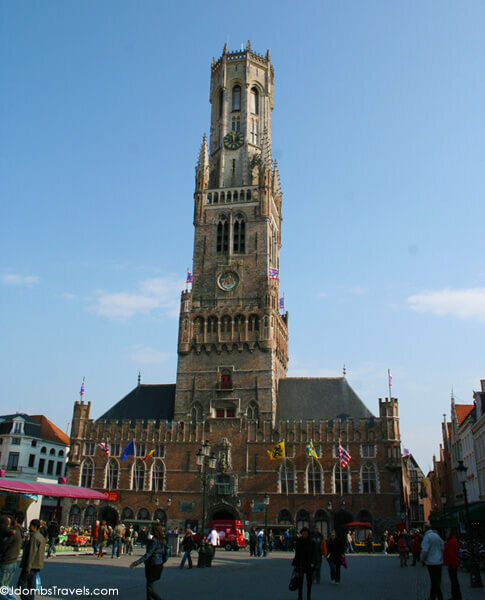 One of the most beautiful buildings of Bruges can be seen in Burg Square, the Gothic town hall from 1376. In the front facade are six Gothic windows. On the front side are also displayed the town weapons of the cities and villages that were under administrative rule from Bruges. 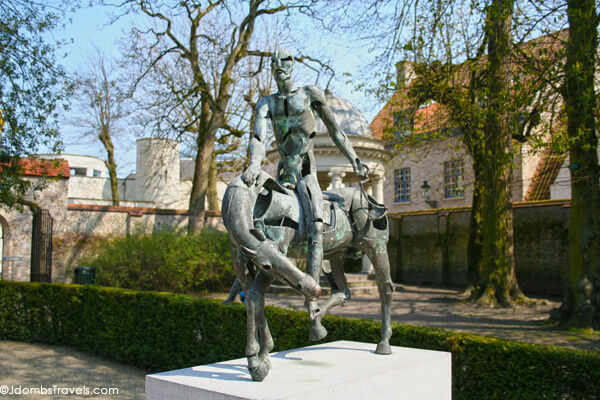 Bruges’ most famous landmark is its 13th-century belfy. It is 83 meters high and leans about a meter to the east. The city still employs a full-time carillonneur, who gives free concerts playing the 47 bells on a regular basis. You can even climb all 366 steps to the top to see the bells up close. 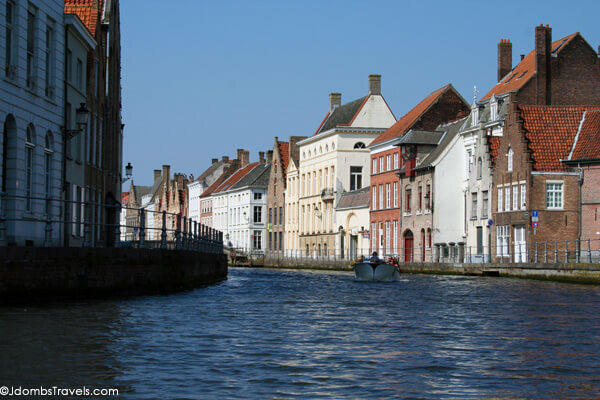 Bruges’ canals were once navigate by ships, originally probably by the Vikings themselves. Nowadays the canals are exclusively used for tourist boats. 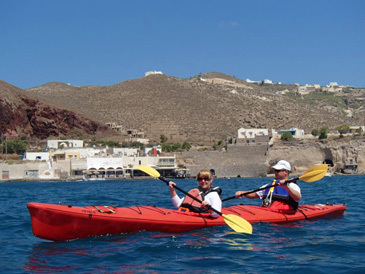 There are five families with the rights to organize tourist excursions by open boats on the canals and each family has four boats. The clippity-clop of horses’ hooves can be tempting to take a carriage ride through the nearly car-free city, but we say skip the carriage ride and take a canal tour instead. Finish off your visit to Bruges by visiting some of the city’s best chocolate shops like Chocolaterie Depla. 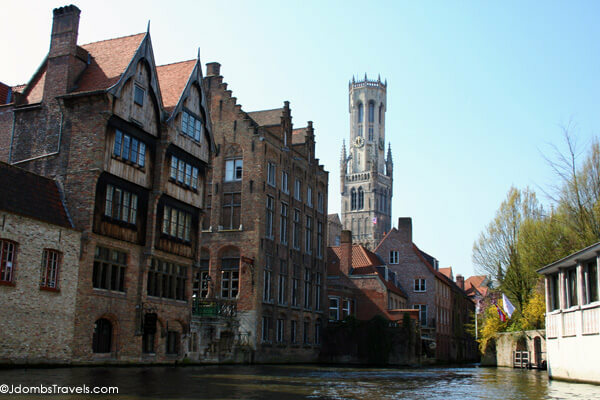 For movie filming locations from In Bruges, check out this guide from Sofie at Wonderful Wanderings. 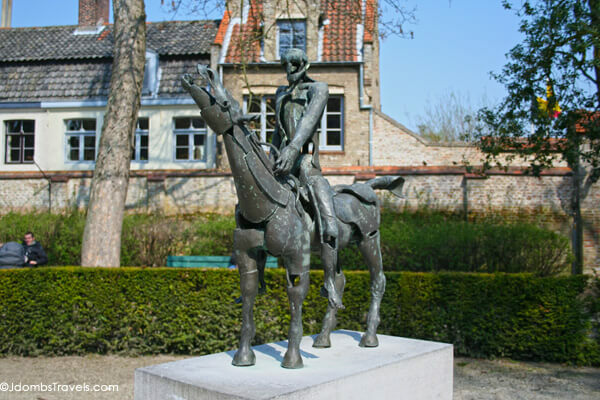 Bruges is easy to visit on the Ghent and Bruges Day Trip from Brussels and costs $62 per adult and $31 for kids ages 4 – 12. Children under 3 are free. Round trip transport from your hotel is included and there is free time in both Ghent and Bruges. 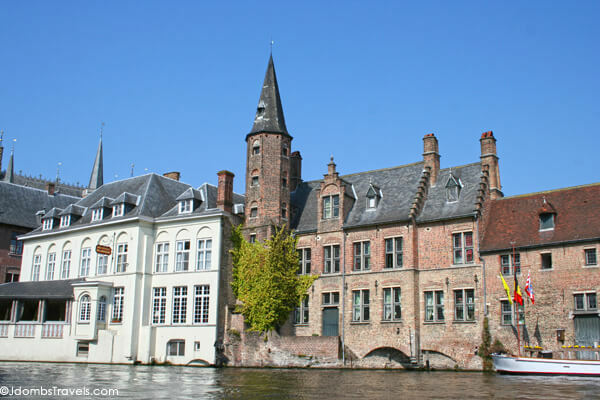 Lunch and optional boat cruise in Bruges (approximately $8 per person) is not included. Hello, I was looking for the history of the Brugge's swans and came across your blog. I will return to read about all your exciting trips. 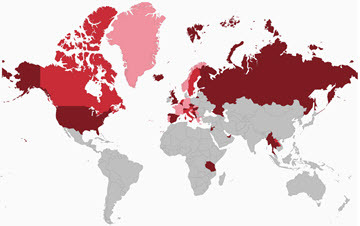 and linked my genealogy blog for my Belgium trip. You are welcome to browse. My Mom went to Belgium several years ago and had a wonderful time. I would love to see The Church of Our Lady some day. Belgium is a great country to visit. Hope you make it there some day, Ellen! Nice to see some pictures of Bruges. We didn’t have time to go to both it and Ghent. We just chose Ghent and really liked it. 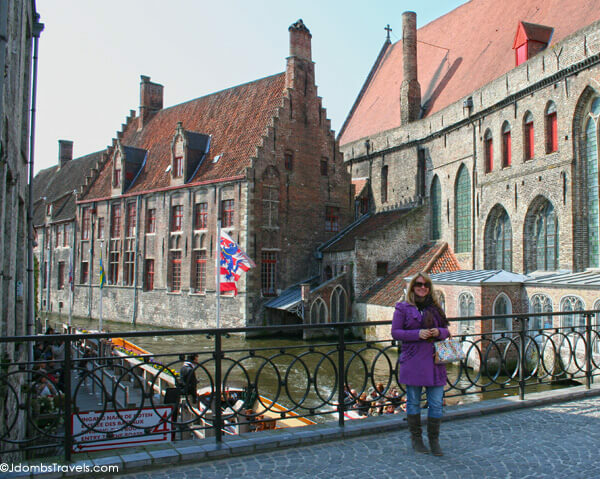 I have heard so much about the crowds in Bruges, I was happy to be in Ghent. The pictures do look very similar though. We were there in spring and there really weren’t crowds. We did both Ghent and Bruges and there were about the same amount of people in both cities. Perhaps it is different in summer. Very nice photos! I’ve wanted to go to Bruges ever since watching that movie “In Bruges”. Lovely! Terrible movie, but beautiful setting. Hope you make it to Bruges some day soon, Frank! Have fun, Rhonda! And eat lots of yummy Belgium chocolate for us. Oh, and if you like loose leaf tea, there is a fantastic shop near the belfry with a delicious selection. I saw your title and had to smile — I did a post about Bruges a while back with the same title. Loved that movie. I was on the train from Rotterdam to Brussels and make a snap decision to change trains in Antwerp and go to Bruges instead. Didn’t get to climb the belfry tower, since it was closed when I was there. One more good excuse to go back. Great pics! Thanks, Cathy! This one was a post from our original blog and from sometime in early 2010. I have tons of them I’ve slowly and painfully getting cleaned up since importing them into our website. I like looking back though to trips like these when we would just go on holiday! This is one of my absolute favorite cities in the world, I think. It’s soooo romantic and poetic. I desperately want to come back there. It really is a romantic city! There are so many cities that profess to be “the Venice of the north” and so far Bruges is definitely my favorite. This brings back wonderful memories! Bruges is one of the most beautiful places on earth. Bruges is lovely. And oh, the chocolate! Yum! I really like your blog! I am going to Europe next month and gonna do a road trip traveling around. I plan to stop by at Bruges, Belgium. What do you suggest to do if I only can spend one day there? Thanks! One of my favorite places I’ve ever been! It’s like stepping into a story book. One of my favorite cities to visit! I love renting a bike to explore the city. Thanks for your suggestions! That will be interesting if they do make a sequel. I didn’t necessarily like the movie, but it did showcase the lovely town very well.